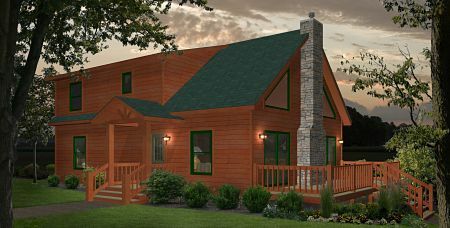 Stratford Homes Lakeshire | Excelsior Homes West, Inc.
Are you looking for a modular cabin with an open second story loft? If so, the Stratford Homes Lakeshire may be the perfect home for you! The Stratford Homes Lakeshire is a three bedroom, two and a half bathroom home with just over 1800 square feet of living space. This home has a second story loft that opens to the first floor main living area, with extra space that can be used for anything–game room, office, TV room, etc. The loft shares the upstairs space with two spare bedrooms and a full bathroom. On the home’s main level, you will find the master suite, guest bathroom, kitchen, dining room, and living room. This Stratford Home is perfect for any Minnesota lake lot, with large windows opening into the main floor living area and loft space. Enjoy a lake view from any level in this home! Contact Excelsior Homes West, Inc. for information and pricing! Customize the Stratford Homes Lakeshire with different options and upgrades available. The Stratford Homes Lakeshire has different options and material upgrades available through the manufacturer. Add a fireplace in the shared living room and dining room space for a cozy feel. Choose from different material options and finishes to make this home your own–the options are endless with Stratford Homes! Visit our location in Hutchinson, MN–At Excelsior Homes West, Inc., we have over ten model homes to tour. We can help you find your dream home!